Hose clamp 4.5 - 6 #88 10/bg Min: 4-1/2"SAE Size: 88Box: 10Max: 6"Band: 1/2"..
4 - 5 1/2 s/s hose clamps Min: 4"SAE Size: 80Box: 10Max: 5-1/2"Band: 1/2"..
5 1/2 - 7 s/s hose clamp Min: 5-1/2"SAE Size: 104Box: 10Max: 7"Band: 1/2"..
5/8 - 15/16 s/s hose clamps Min: 9/16"SAE Size: 8Box: 10Max: 15/16"Band: 1/2"..
316 hose clamp #4 3/8in sae Min: 7/16"SAE Size: 4Box: 10Max: 11/16"Band: 3/8"..
7/8 - 1 1/4 s/s hose clamp Min: 7/8"SAE Size: 12Box: 10Max: 1-1/4"Band: 1/2".. 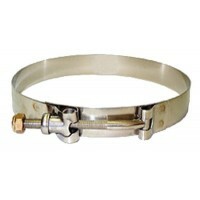 Hose clamp 1.75-2.75 #36 10/bx Min: 1-3/4"SAE Size: 36Box: 10Max: 2-3/4"Band: 1/2".. 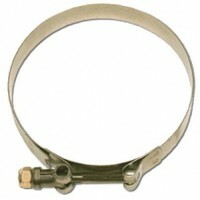 Hose clamp mini 29/64 - 33/64 Min: 29/64"SAE Size: MiniBox: 10Max: 33/64"Band: .. Designed for venting of bilge gases. 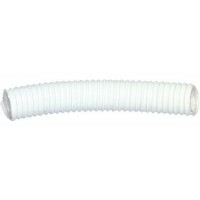 Wire reinforced vinyl hose that is light and easy to bend. For ..
T-bolt clamp 2-25/32 to 3-3/32 Min: 2.766"Max: 3.062"..
T-bolt clamp 2-9/32 to 2-19/32 Min: 2.344"Max: 2.562"..
T-bolt clamp 3-9/32 to 3-19/32 Min: 3.266"Max: 3.562"..
T-bolt clamp 4-3/8 to 4-15/16i Min: 4.37"Max: 4.94"..
T-bolt clamp 5-3/8 to 5-15/16i Min: 5.37"Max: 5.94"..
T-bolt clamp 5-9/32 to 5-19/32 Min: 5.266"Max: 5.562"..
T-bolt clamp 6-5/8 to 7-3/16in Min: 7.37"Max: 7.94"..
T-bolt clamp 6-9/32 to 6-19/32 Min: 6.266"Max: 6.562"..
T-bolt clamp 8-19/64 to 8-7/8i Min: 8.30"Max: 8.87"..
T-bolt clamp 8-9/32 to 8-19/32 Min: 8.266"Max: 8.562".. Cast bronze. Hose: 1-1/2"Pipe: 1-1/2" NPT.. Cast bronze. Hose: 1-1/4"Pipe: 1-1/4" NPT.. Cast bronze. Hose: 1"Pipe: 1" NPT.. Cast bronze. Hose: 2"Pipe: 2" NPT.. Cast bronze. Hose: 3/4"Pipe: 3/4" NPT.. Cast bronze. Hose: 1/2" & 5/8"Pipe: 1/2" NPT.. Cast bronze. Hose: 1/2" or 5/8"Pipe: 1/2" NPT..
Used for connecting hose to valve, seacocks, strainers or any hardware having female NPT pipe thread..
TPC series tail pieces are threaded with NPS (straight) female pipe thread, and are for use with GRO.. Cast bronze. Straight, standard flow. Hose: 1" IDPipe: 1" NPT..
Standard Flow. Hose: 1"Pipe: 1" NPT.. Cast bronze. Straight, standard flow. Hose: 1-1/2" IDPipe: 1-1/2" NPT..
Standard Flow. Hose: 1-1/2"Pipe: 1-1/2" NPT.. Cast bronze. Straight, standard flow. 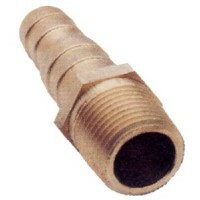 Hose: 1-1/4" IDPipe: 1-1/4" NPT.. Cast bronze. Straight, standard flow. Hose: 1-1/8" IDPipe: 1-1/4" NPT..
Standard Flow. Hose: 1-1/4"Pipe: 1-1/4" NPT..
Standard Flow. Hose: 1-1/8"Pipe: 1-1/4" NPT..